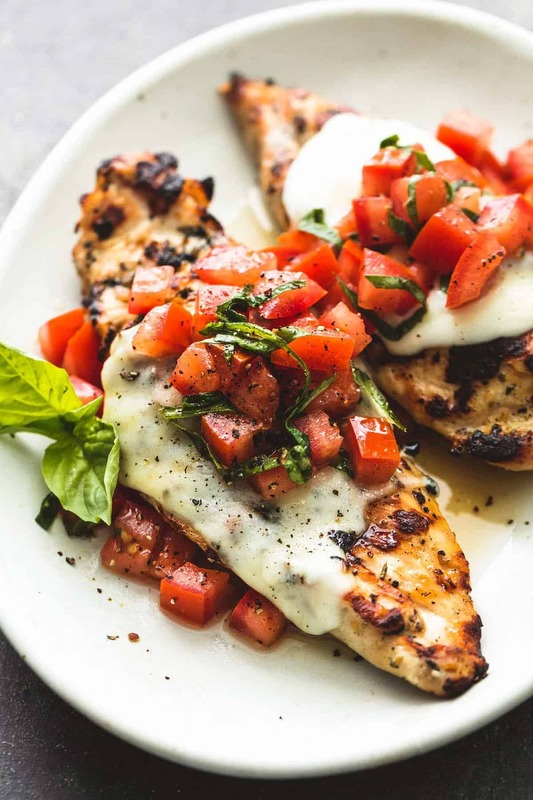 Easy, healthy grilled bruschetta chicken with simple seasonings, melty mozzarella cheese, and a fresh tomato and basil topping is the perfect summer meal! BBQ season is here and after you try Grilled Bruschetta Chicken, you’ve gotta try Grilled Chicken Souvlaki & Tzatziki Sauce, Best Quick Steak Marinade, and Grilled Smothered BBQ Chicken Foil Packs. So many delicious things happening here, I can hardly contain my excitement about this super awesome grilled chicken dish. 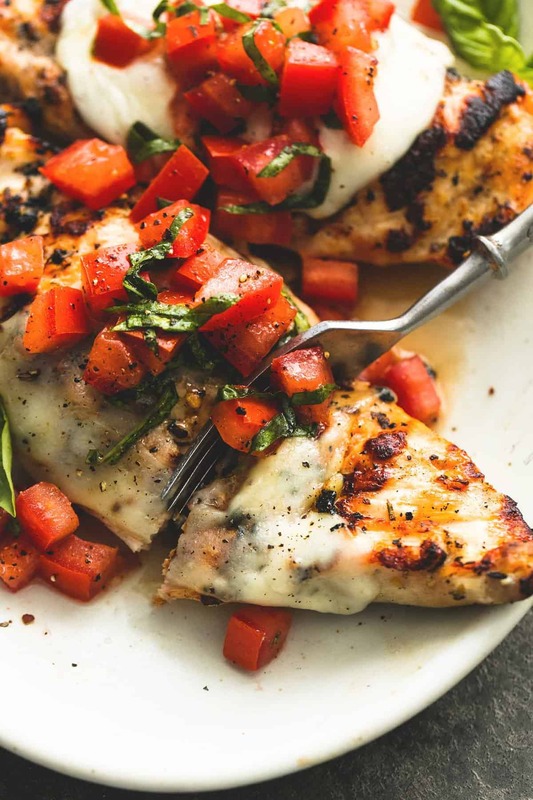 If we are talking juicy, savory grilled chicken under a layer of hot, melty mozzarella cheese, topping with fresh tomato and basil salsa….. I’m in heaven. I could curl up with a good book and a plate of this chicken and be a happy gal for the rest of my days. We moved into this home mid-Fall last year and I was over the moon to find that the previous owners had planted a small (and very manageable) garden on the far side of our yard. It’s the perfect size – for someone like me who lacks both time and a green thumb – and is divided into three rectangular plantar boxes. Before temperatures plummeted for the Winter, the tomato vines were still producing loads of tiny adorable red and golden tomatoes and I was popping them like candy. My husband would never eat a tomato alone, so I had the lot of them to myself and I was not one bit sad about that. I really, really heart fresh tomatoes. 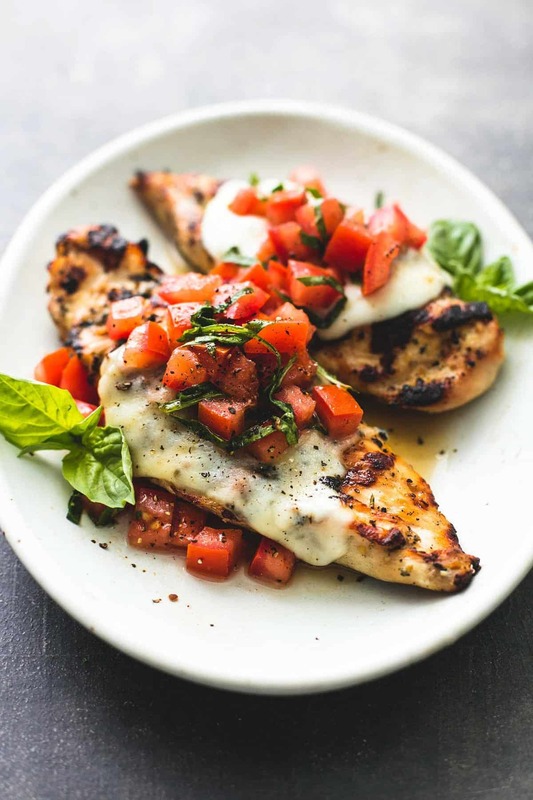 Tomatoes are the star of this grilled bruschetta chicken recipe. Paired with some fresh lemon juice, chopped basil, and salt and pepper, they turn a simple chicken dish into a whole other super tasty experience. This recipe is incredibly simple – and sometimes less is more if you ask me! Just toss your chicken with a bit of olive oil, salt and pepper, some dried herbs, and a hearty dose of garlic powder, and grill for about 15 minutes. 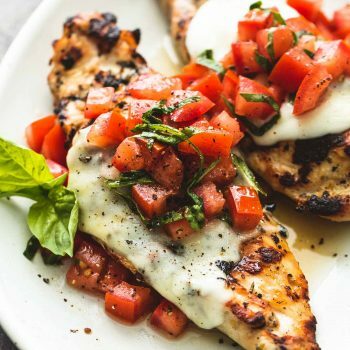 Top each chicken breast with a thick slice of mozzarella cheese and watch as it gets all sorts of ooey gooey melty delicious right there on the grill. Once your chicken is done, top it off with your tomato and basil mixture, along with a bit of fresh cracked black pepper, and you’re done my friends. You and your family are going to love how delicious and easy this recipe is! 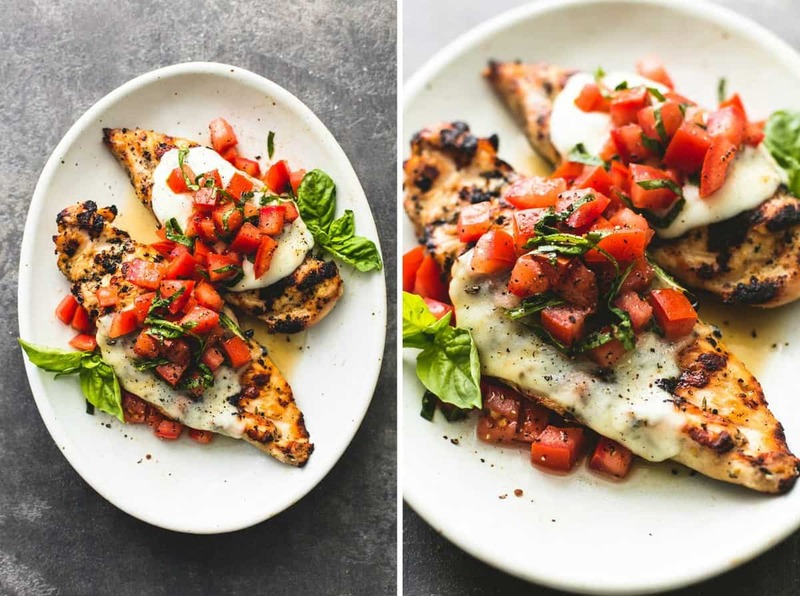 “Just made this chicken bruschetta recipe and it was perfect. Made no changes to ingredients of recipe. Not only delicious but beautiful in presentation.” – Mary M.
In a large bowl combine chicken, oil, Italian seasoning, garlic powder, and black pepper. Stir to combine and coat chicken evenly with the seasonings. Grill chicken over medium-high heat 6-8 minutes on each side or until cooked through. While chicken is cooking, prepare the topping. In a medium bowl combine tomatoes, salt and pepper, lemon juice, and basil and stir well. Once chicken is cooked through, top each chicken breast with a slice of mozzarella cheese and cook for about 1 minute longer until cheese is melty. Top chicken with tomato basil topping and serve immediately. hey girl- this chicken looks amazing! Making Bruschetta is my favourite pastime when my small, and sporadically attended, kitchen garden produces tomatoes. It seems all I eat during the summer and autumn months is Bruschetta in one form or another. And on top of grilled chicken (that oozing mozzarella…. yum!) – this has to be tried! Just made this for dinner it was amazing! Love the simplicity and tastiness of these recipes; especially the foil packs! Just made this and it was super tasty – the only thing it’s missing is a little balsamic vinegar! The family said is a keeper. I will definitely do this again I. Was great. I did add a little drizzle of balsamic reduction like I do on bruschetta. This recipe is amazing! My husband and I made this for dinner last night and I love the lemon juice it really brightens up the flavors. This was great! Our grill is broken, so I broiled them and it was still really good. I marinated my chicken in skinny girl balsamic dressing before I grilled it. Added a bit more flavor. Are you using fresh mozzarella in this recipe? Hi Melinda – I used sliced mozzarella from a package at the store for this, but fresh mozzarella would be fantastic on this as well! Hi Tiffany, I am just finding your website and your recipes look amazing. I am wondering, since cooking in aluminum foil is getting a bad wrap, could packets be made with PARCHMENT paper with same outcome? Hi Carol- welcome to Creme De La Crumb! If you don’t want to make the foil packets in straight foil and would rather use parchment paper, I recommend putting them in parchment paper and then foil around that to seal it. I don’t think you will be able to seal as well with just parchment paper. I bet that is so good! The sauce with salmon would be great! Thanks for sharing your ideas, Lauren! Just made this chicken bruschetta recipe and it was perfect. Made no changes to ingredients ofrecipe. (I did brine chicken for 30 minutes. ) Not only delicious but beautiful in presentation. Yayyy! Super excited to hear that you enjoyed this recipe so much, Lauren! I sadly don’t have grill, how long would I cook this in the oven for and temperature? Hi Amanda- I would start at 375 degrees for 20 minutes- make sure your chicken is pounded to even thickness, less than 1 inch thick.